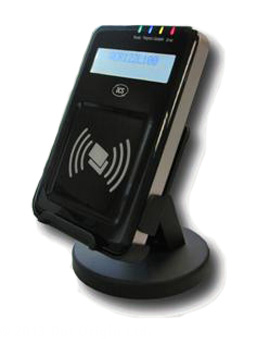 The ACR122L serial RS232 desktop reader with LCD is an NFC contactless smartcard reader that has been developed based on the 13.56 MHz Contactless (RFID) Technology and the ISO/IEC 18092 Standard for Near Field Communication (NFC), supporting both NFC and Felica contactless technologies as well as MIFARE and ISO 14443 Type A and B cards. The ACR122L is a serial RS232 Plug and Play device which allows interoperability with various different devices and applications. The reader comes with 4 LEDs, a buzzer and a 2-line graphic LCD for rich user interaction. The ACR122L is also equipped with 3 internal ISO 7816 SAM slots for secure NFC and contactless operations. The operating distance is 5 cm depending on the type of contactless card or tag in use. The ACR122L is ideal for various NFC and contactless applications such as e-payment, e-ticketing, point-of-sale and embedded systems. 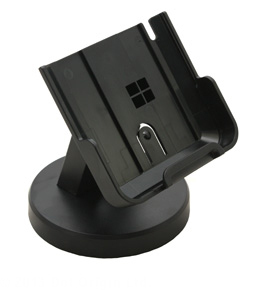 The package comes with a retractable stand, and a cable with a standard 9-pin serial connector for data communication, plus a connector for power transmission from the enclosed 7V AC/DC adaptor. The ACR122L is compatible with Read-a-Card, the contactless card ID reading application, useful for the integration of RFID technology into new or existing systems. Developers of new applications will need to purchase the ACR122L Serial SDK first.